Let the spirit of Holi discover the crazy side of your loved ones and you as Imagica, India’s favorite entertainment destination, invites you to Imagica Holi Bash. The most happening, four-day Holi Party near Mumbai, Pune and Lonavala is bundled with unlimited fun, music by international DJ’s and mouth-watering Holi-themed delicacies. 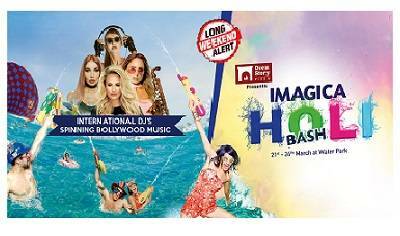 Between March 21, 2019-March 24, 2019, Imagica Holi Bash will offer an escape with the perfect medley of never ending thrills and frills and an excuse to party the long weekend away. Add to the euphoria of the wave pool party and up the crowd tempo, the four popular and power packed international DJanes’s - DJ Univz from Ukraine, DJ Nina from Poland, DJ Tayla from Ukraine and DJ Julia from Russia are set to belt out Bollywood songs to get everyone grooving and moving. “Each year the Holi celebration at Imagica is designed to offer the best entertainment to its guests. This year being no different, the entertainment quotient will be scaled to newer heights as the international DJane’s will spin music chart busters and add to the excitement,” said Mr. Tabish Khan, GM - Events & Alliances at Imagica. So head to the weekend party destination near Mumbai, Pune and Lonavala where the party never ends and celebrate Holi with gusto!